The Presidio is a National Historic Landmark District, encompassing nearly 1500 acres, including more than 800 acres of open space and 145 acres of native plant communities. The area’s ecology is unique, as is its social and political context. The Presidio supports vibrant community groups, passive and active recreational uses, and historic, cultural, and natural resources. Within this exceptional setting, and in close proximity to human uses, are habitats for 14 rare plant species and numerous special-status wildlife species. 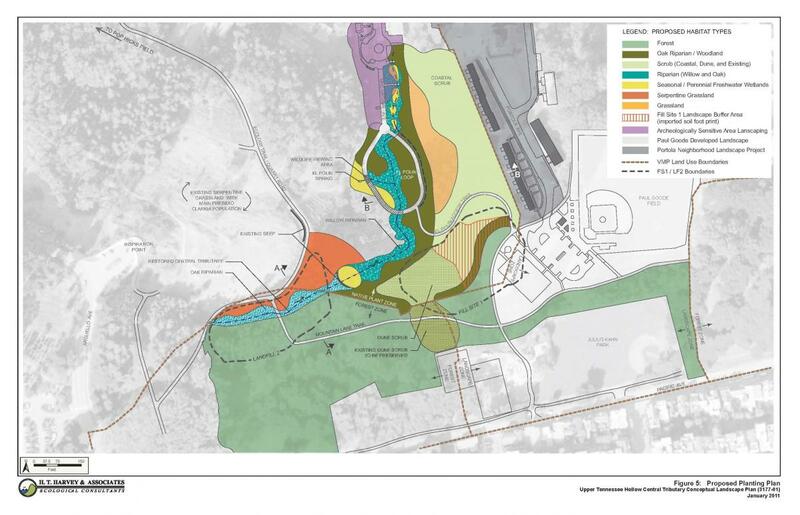 Our success at the Presidio is based on facilitating collaboration amongst varied interest groups.Through our expert landscape architecture and ecological consulting services, we build consensus around solutions for site challenges that center on natural resources and human uses. Our services: environmental analysis, conceptual restoration planning and design, construction documentation, regulatory permitting guidance, construction oversight and permit compliance monitoring, and long-term vegetation monitoring. We successfully applied these services to more than 20 different sites covering nearly 100 acres of native habitat, including dune, dune scrub, coastal scrub, serpentine grassland, freshwater wetland, riparian, oak woodland, and historical forest. Our designs have incorporated public access and trails, cultural and historical interpretive features, and the Presidio Trust’s goals for environmental education. 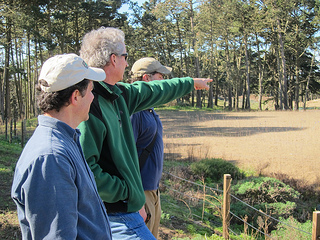 H. T. Harvey & Associates has planned, designed, and oversaw the installation and long-term management of habitats across the Presidio, including several acres of coastal scrub and dune habitat, habitat for the federally and State-listed endangered San Francisco lessingia, freshwater wetlands, and riparian habitat. Our work on coastal dune and scrub habitats was innovative. 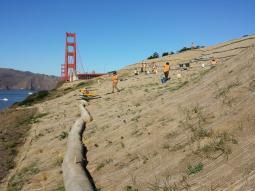 Using cutting-edge grading designs to initiate the dynamic geomorphic processes which sustain dune conditions, we provided and supported the landscape required by San Francisco lessingia. 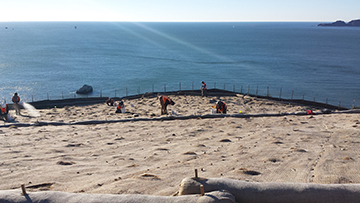 To achieve this end, we collaborated extensively with the Presidio Trust to design the re-creation of a weathered coastal dune habitat, incorporating the use of native sands excavated from the California Academy of Sciences site in nearby Golden Gate Park. We then designed pilot dunes that would be reshaped by the prevailing winds to sustain the specific dynamic dune-face feature on which San Francisco lessingia grows. For example, our team facilitated compliance with Memoranda of Understanding with the U.S. Fish and Wildlife Service and the National Park Service. Although most of our permitting work focused on ensuring compliance during restoration design and implementation, we also obtained original permits for the Presidio.